What Makes Singapore a Top Destination for Shoppers? Have you an idea of the top budget-friendly shopping malls and locations in Singapore? Below we provide you with a list of 5 of the best shopping malls and places one can shop when they find themselves in Singapore. This mall is situated on Orchard Road. A melting pot for the in fashion, young clothing trends this is a must for the youthful shoppers who want to quench their shop appetites at an affordable rate. it’s also home to some amazing Japanese and Korean restaurants. Situated in Little India, this shopping mall offers many affordable titbits, food options, clothing apparels and much more. It is open to the public 24 hours a day. This shopping mall has been split in two: one part selling household goods, jewellery and stuff found at regular supermarkets while the other retail products such as books and clothing apparel. This shopping location is really popular among Singapore teenagers. If you love cheap places to shop at then this is the place for you. It happens to be one of the most pocket-friendly places to shop at in Singapore and is widely known among the locals for its outstanding bargains. Both female and male clothes can be found for as low as $4 here. This shopping mall is also found at Orchard Road. Besides being located at one of the more expensive shopping locations in Singapore, this mall houses stores that peddle some of the most affordable and pocket-friendly shoes and clothes in all of Singapore. On the weekends they play host to a flea market that sells second-hand goods found on the 6th floor of the building organised by the locals. However, it gets quite packed on Sundays mostly due to the large Filipino community found in Singapore. Although if you love a crowd while you shop has at it. 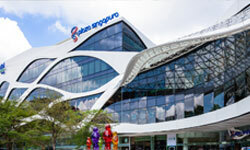 Located more toward the West, this happens to be the largest shopping mall in Singapore boasting over 80 store outlets for locals and foreigners to shop at Shoppers can get up to 80% of regular retail prices at this shopping location. Many worldwide recognized brands can be found at this mall, such as Kappa, Adidas, New Balance, Nike, Charles & Keith, Juicy Couture, Converse and much more Above are the five most affordable shopping locations and malls found in Singapore. If you are one who loves a great bargain and is in Singapore try and make your way to some if not all these locations and malls mentioned above. You won’t regret it.